The Downs Chemmart Pharmacy and News owners Janine and Henry Gulev. Five years ago, the entire shopping centre, along with his pharmacy, burned to the ground. Since re-opening in 2010 however, the pharmacy, spurred on by local residents who were forced to go elsewhere for two years, has gone from strength to strength. 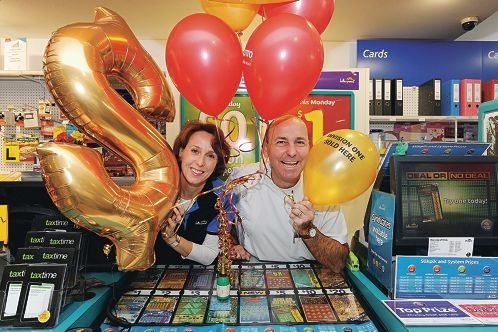 Mr Gulev said the ‘good vibes’ of local residents were having a definite effect, with three lucky Lotto players winning big at the pharmacy, including a win of $2.5 million at the pharmacy last Tuesday after Monday night’s Lotto jackpot. ‘Really, I think the bad luck has transitioned to good luck and people are enjoying it while they can,’ he said. Six months ago, the pharmacy sold a Division One prize of $880,000, while two months ago a $5 scratchie resulted in a windfall of $100,000. What pleases Mr Gulev the most is that both those prizes went to locals, and he hoped the same could be said for last week’s big win. ‘LotteryWest are very limited in what they can tell us, but I’ve asked them to let me know if it’s a local, at the very least, because that would just be so fitting.